Remember that stack of 17 books I was planning on reading while I was in Maine? Well, let’s just say I didn’t quite make it to 17. BUT, I only missed it by 12 books. Yes, that’s right, I only read five books. Bookertalk was my first commenter on that post and she was right with her guess of five. 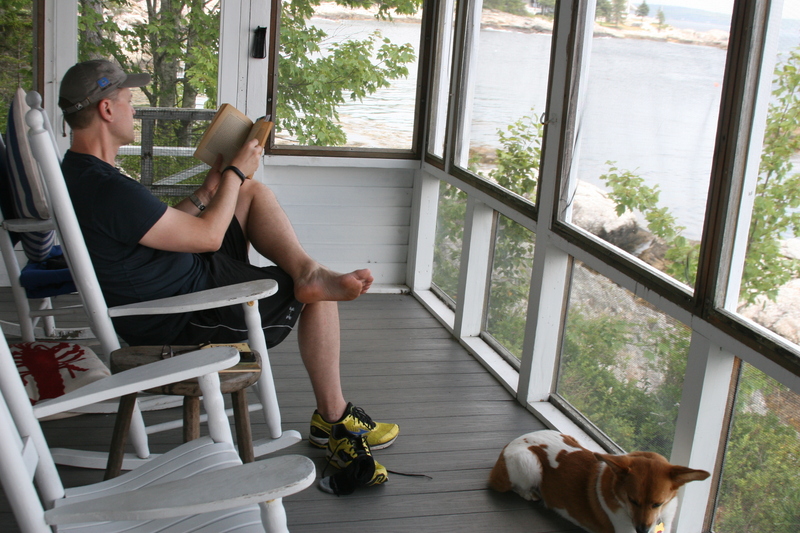 Like most of the rest of you who commented, I expected to read more like 7 books during the two weeks Maine. And for the first week I was on track to do better than that. By the time the first seven days were over I had read 4.75 books. So what happened the second week that I only managed to read a quarter of a book? I can sum it up in two words: people and puzzles. The first week there were a total of nine of us in the house with four oldies, two 21-year olds, and then one each at 15, 13, and 11. How in the world did I manage to read 4.75 books, do two 1,000 piece jigsaw puzzles, learn how to play backgammon, and kayak almost every day? Looking back I am not entirely sure, but the rest of the house went on a fair number of excursions which allowed me totally uninterrupted reading time. 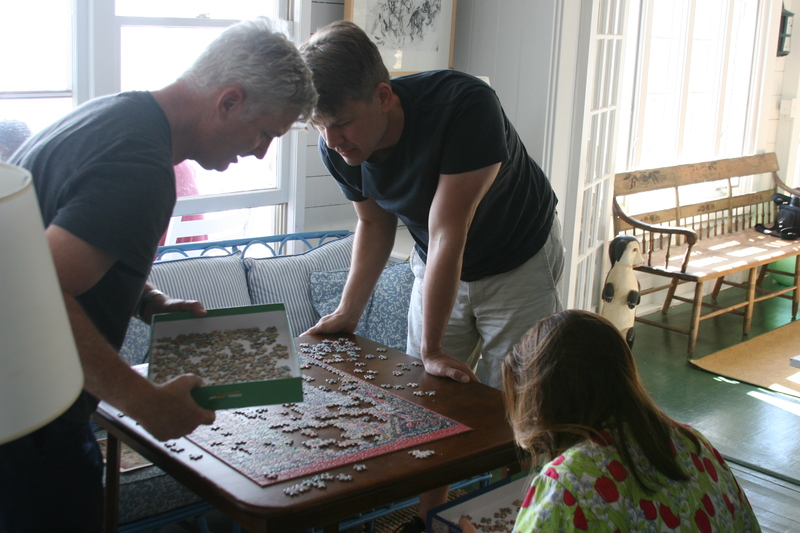 Puzzling with John’s brother and his fiancee. I would like to say that staying completely off of social media for 14 days also helped with my book count, but that had no effect the second week, so maybe that wasn’t as much of a factor as I think. I may have spent more time at the puzzle table than the first week, but the real reason was lots more visiting and sightseeing with guests and a four-day saga of trying to get a hold of my Dad’s luggage that decided to vacation in Tampa rather than Maine thanks to Delta. Oh dear. That’s only four books. I guess some of the partially read books (Paradise News and The Woman Upstairs) and one DNF (Leaving Atocha Station) clouded my memory on this front. I can say unequivocally that the four books that I did finish were all pretty spectacular. In fact, Being Dead has ascended into being one of my favorite books for the year, but more on that another day. Why post a picture of a book I did not finish (and won’t be finishing)? Because the cover is what got me to buy it in the first place. 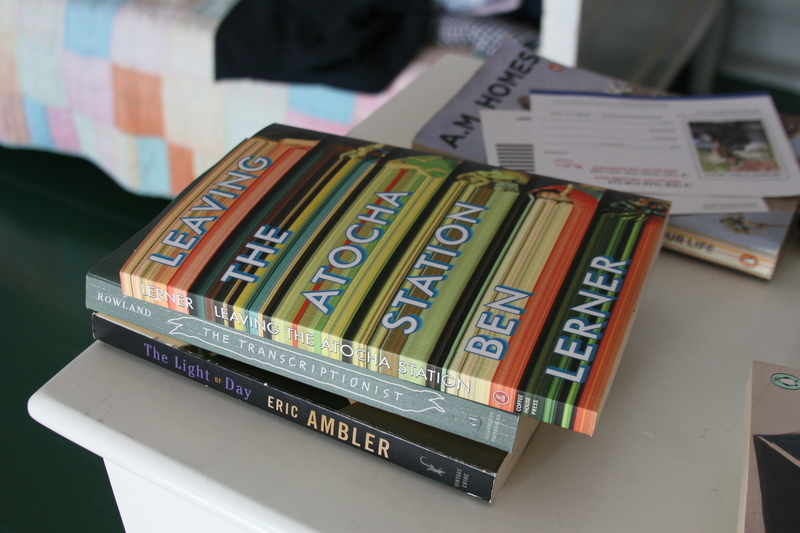 But surely I must have spent so much time in the many used bookshops I visited over the two weeks, right? I popped into a few, but for the most part I wasn’t really in the mood to look for anything other than books by Cecil Roberts. Remember he was the one who wrote that delightful surprise Victoria Four-Thirty that I loved so much. And his books are of a vintage and (lack of) popularity that I knew only a certain kind of dusty old bookshop would give me a chance in hell of finding anything by Roberts. I could tell with most bookstores along the way that their stock was going to be too new and or too curated to customers’ tastes. But I also knew there was one bookshop close to the house we stayed at the second week that would fit the bill. When we went to Dooryard Books in Rockland, Maine four years ago, I spent a lot of time combing shelves, dust, and even some musty boxes in the basement. But my overall feeling that time was that I only bought some mildly interesting things because I didn’t find anything that really excited me. This time I thought that the fusty, seemingly neglected stock, would work in my favor. And it did. But some of it wasn’t so neglected. 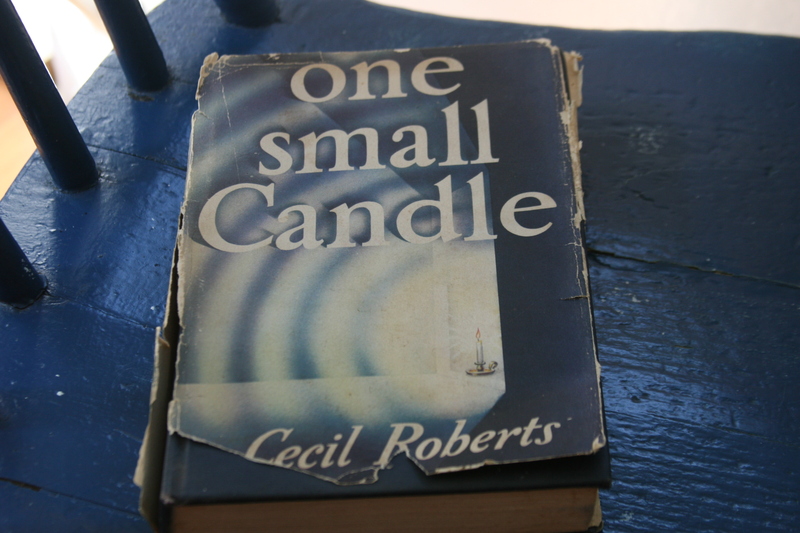 I have no idea what this about, haven’t taken the time to read the tattered flap even two weeks later, but I am as excited as hell to have found another Cecil Roberts. Found this within the first 3 minutes of being in the shop which kind of opened up the flood gates a bit as you will see in the following pictures. 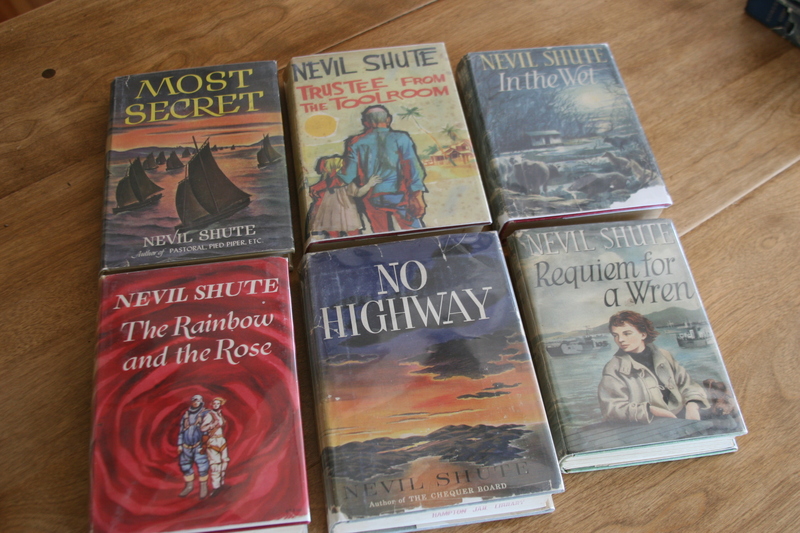 Although the shop seems like nothing ever leaves and nothing new ever comes in, the presence of these six Shute first editions in really good shape disprove that notion. They sure weren’t there four years ago. And did I mention that all fiction was 50% off? (You may recall from the photo in my last post that I brought an old mass market paperback of The Rainbow and the Rose as part of my stack of books to read. Glad to have found this copy because that brittle paperback probably would not have survived being read. These all represent taking a chance based on cover and a very slight inkling that I might find another gem like Victoria Four-Thirty. 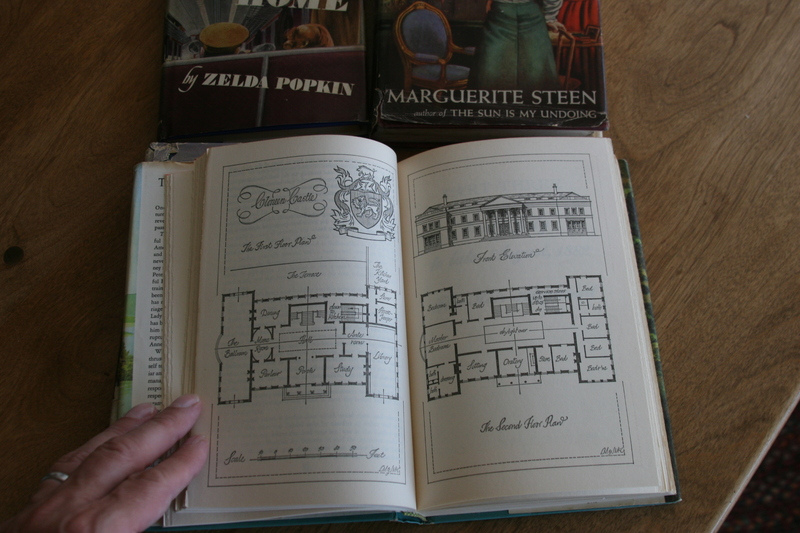 The Keyes novel has floor plans! 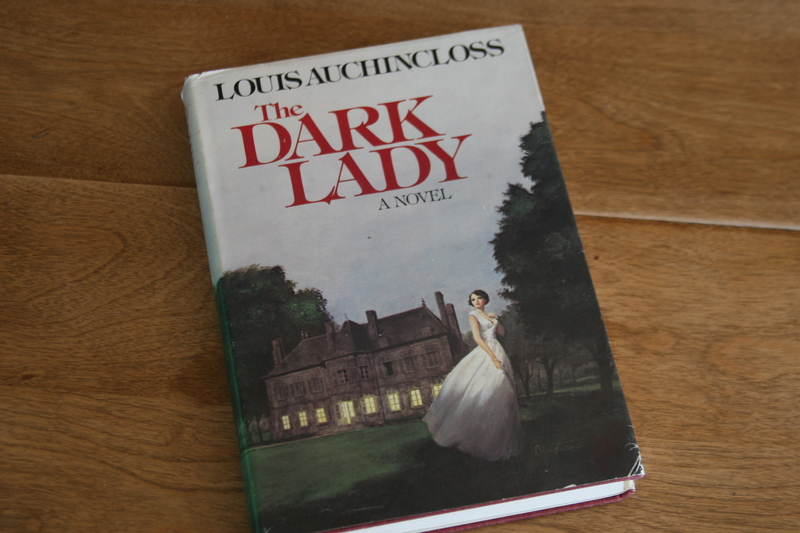 The two Auchincloss novels I have read so far have been wonderfully satisfying. This one was in the dusty basement, but there was another one on the main floor that was an expensive first edition ($60) that I thought I could probably find cheaper somewhere. I kind of wish I had gotten it. Especially at 50% off. 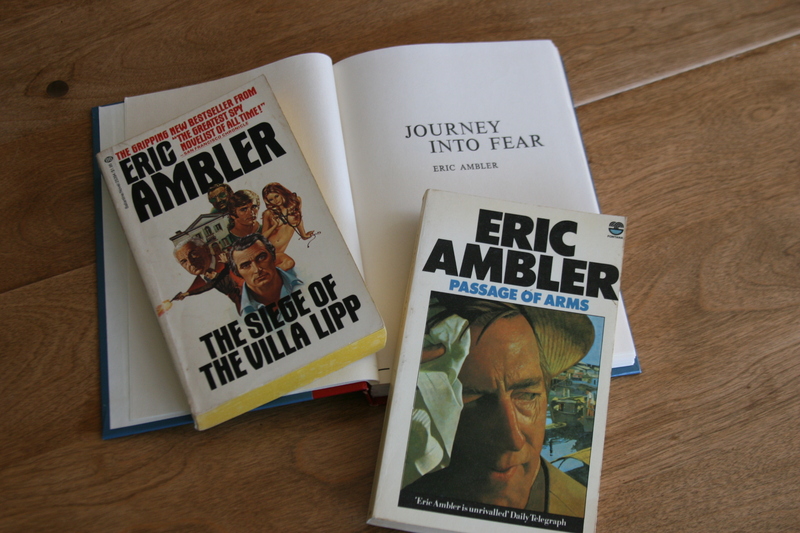 Unless they were published under different titles, I don’t have any of the Ambler. 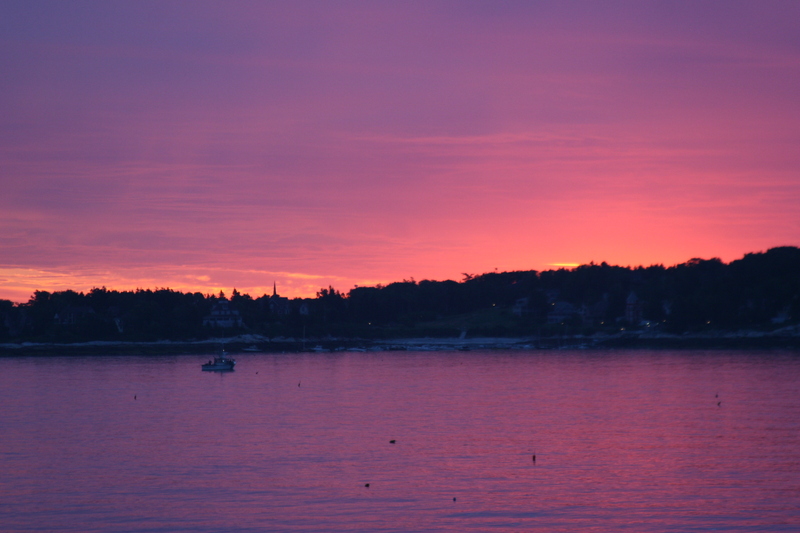 I was trying to get clever and include Maine in the background but the lighting wasn’t good. And everything was really reasonably priced. It was a great trip for sure. Can’t wait to do it again. Fabulous finds! Ambler is great! He really has become one of my favorites. A go-to author for me for sure. 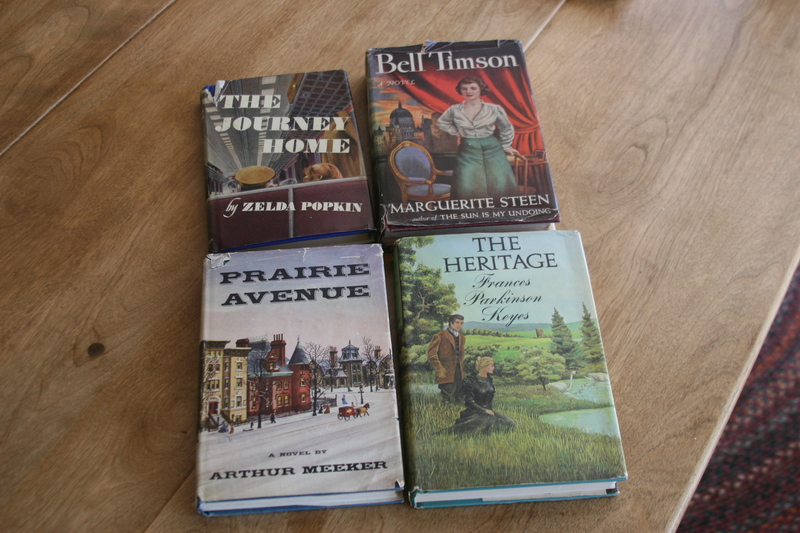 You seem to have a genius for finding good secondhand bookshops in obscure places! The nice thing is that the Maine Antiquarian Book Association has a website that pretty much lists all used bookstores in the state. All states should do this. That sounds an idyllic vacation and for once in a long while when shown holiday snaps I’d like more. I’m enjoying The Professor’s House right now – beautiful writing and the perfect length, so thanks for the recommendation, Thomas. I’m so glad you are enjoying The Professor’s House. My fears about recommending it were allayed last year at Booktopia in Petoskey where I got to see and hear first hand how people enjoyed it. 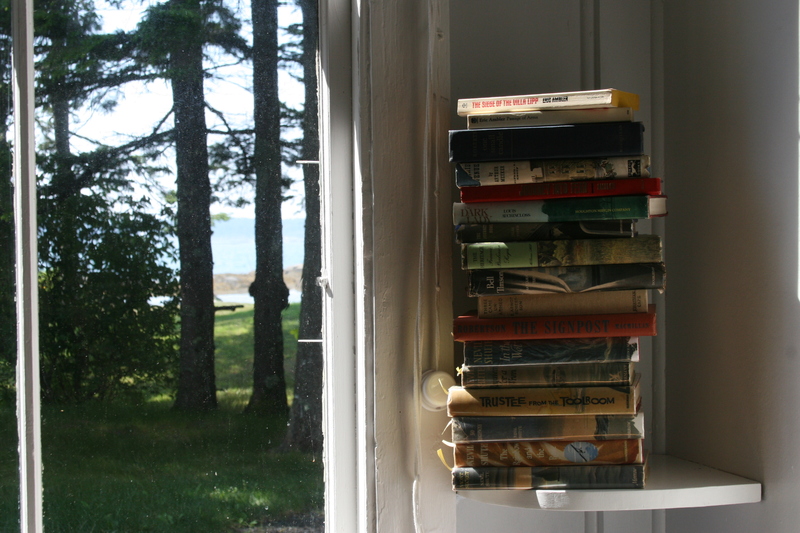 We’re headed to Cape Elizabeth, ME, this fall and I’m looking forward to exploring the used bookstores in Portland. We went to Camden last year and I believe I went to all the used bookstores near there, including the one you mentioned. I am assuming you will drive. There is one in/near Portsmouth, NH right on the Maine line that I went to years ago. The place was big and chock full of books, but the owner was clearly a hoarder and didn’t seem to mind that the entire fiction section was blocked by boxes. After about 10 seconds I realized I had to leave and he was cranky and unhelpful. But boy, there was a lot of potential there. Thanks for the tip, Thomas. We will be driving, so I’ll have the option of stopping wherever I want, as long as Jack doesn’t get too grouchy about it (which he usually doesn’t). Looks like a lovely vacation and such beautiful covers! I have not had luck in used bookstores, but I think I need to look harder. Most I have found have books from the last 20 or so years and I need to find better, older collections. Most used bookstore owners who actually want to make money have some combination of recent (past 20 years) books and then other things that are antiquarian. The kind you need to find are the ones that are either huge, have a bargain basement, or are terribly run, or all three. In some ways I wouldn’t like the used bookstore that I would own because it would be too tidy and organized for customers like me to find hidden stuff. I am so envious of your trip! It sounds wonderful. All of it. And to top it off another CECIL ROBERTS book! I loved Victoria 4:30, too, so I am anxious to hear your thoughts on his other books. Your photos were great. I want to hug Lucy. I’m a tad bit worried that the Roberts may not be any good on one hand, and saving it for a rainy day on the other. Drat, we should have run a sweepstake and then I could have walked off with the prize and felt very superior. 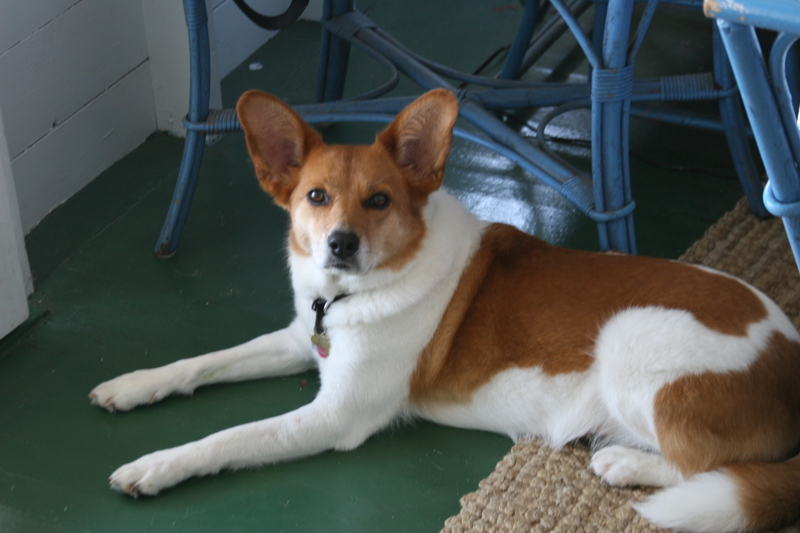 It would be the first time my crystal ball gazing worked – usually I am dire with predictions…. As for why you didnt read more – its called having a holiday with loads of people around you which makes it hard to find any quiet time. There’s always someone coming up and wanting to chat. then the endless cycle of thinking what to eat next, preparing the meal, eating, clearing up and then only a short time before it starts again. Those covers! Those FLOOR PLANS! Well, you came back with loads of books and if you had some DNFs that reduces the TBR, right??? The funny thing is, I came back with about 1/3 of what I might normally do on a trip like this.